Dark Tranquillity, the Swedish pioneers of the so-called Gothenburg sound, are no newcomers to visiting Finland. 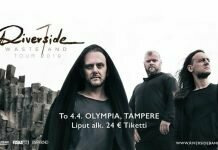 The band, having released their acclaimed Atoma album last year, made a pit-stop on their release tour in the midst of the hottest Finnish party season, as they visited Tampere’s YO-talo on May Day’s eve and in Helsinki’s Nosturi the day after. 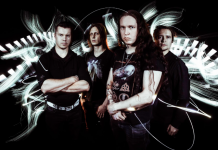 For support bands, Dark Tranquillity had Wolfheart, Tuomas Saukkonen’s latest band, as well as Nailed to Obscurity from Germany, playing a more doomy style of melodic death metal. This presented a wonderful opportunity to end my party streak on a high note, as I was celebrating my last May Day as a student and Dark Tranquillity has been one of the most important bands for me at least over the past 10 years. Since the show took place on a Monday night, the early showtimes presented a problem – I scoured the show’s Facebook event, but didn’t manage to find them anywhere, so I had to try to guess when to arrive. I had the feeling that I would probably be a bit late, and upon arriving at Nosturi around 19:45, Nailed to Obscurity was almost done with their set. I opened up Facebook one more time and finally found the showtimes, stating that the band had started 20 minutes earlier. Definitely my fault, but I’d like to stress that the showtimes should always be visible in the event description, instead of just posting them into the discussion. Nailed to Obscurity wasn’t familiar to me in any way, but the few songs that I got to check out seemed pretty decent. Their slow songs had great guitar leads and the drummer played sharply; I could easily recommend the band to anyone fancying Swallow the Sun, for example. At the end of their set, the vocalist, Raimund Ennenga, thanked the scarce-ish audience for showing up early and retreated backstage, letting the rest of the band finish the last song. The members left the stage one-by-one, leaving the guitarist and the drummer to play the last bars. I was bummed to miss most of it, but what can you do? Next up was our own Wolfheart. Led by Tuomas Saukkonen, the band took the stage and delivered a feisty 45-minutes of metal. A few years ago, Saukkonen used to have four different bands going on simultaneously, before suddenly announcing that he was going to disband them all, instead founding Wolfheart. Since then, the band has already released three full-length albums. I’ve always considered the outputs of Saukkonen’s various bands to be pretty similar, and unfortunately tonight’s show didn’t give me any reason to think otherwise, as Wolfheart’s material also consisted of fast melodeath songs, combining Saukkonen’s shredding guitar riffs, harsh vocals, double bass patterns, and blastbeats. To find something different when compared to Saukkonen’s previous bands, Wolfheart’s lead guitar riffs are maybe a bit more reminiscent to, let’s say, Amorphis, and the stand-in guitarist for Mika Lammassaari played them with ease; and he supposedly only had had three days to practice. To describe it with only one word, I’d have to say that the setlist was a bit numbing; six of the seven songs played were fast and aggressive – only “Abyss” broke the pattern, being by far the most interesting song in the set. The stage sound might have been a factor, since one couldn’t get anything out of Joonas Kauppinen’s totally mushed-up double bass beats. Still, what I found the most annoying thing was Saukkonen’s total lack of interaction with the audience, as he didn’t say a word between songs, leaving the bassist, Lauri Silvonen, to do the speeches. Speaking of the audience, most people raised their hands politely when asked, but for the most part, the action in front of the stage was pretty static. Wolfheart had 50 minutes of play time, but I don’t think they used all of it. To conclude, and concur with our photographer Janne: that’s gonna be a no from both of us, but maybe we can try this again in Nummirock! Time for the main event! Dark Tranquillity is one of those bands you simply cannot see live too many times, as they have eleven studio albums to pick songs from. DT has also kept the bar high in terms of material quality, wherein their countrymen, In Flames, dipped big time with their 2008 output, A Sense of Purpose, and haven’t recovered since. A moment before the show started, the curtains were pulled aside, revealing a stage-wide video screen, projecting the typical futuristic interlude visuals. Black Sabbath’s “Iron Man” served as the intro track, after which the band took the stage and began – maybe a bit surprisingly – with Atoma’s “Force of Hand.” Performed without front spotlights, the photographers probably weren’t very fond of the choice, but the audience gave their all from the start. After “Your Lesser Faith” followed, Mikael Stanne expressed his heartfelt gratitude to the audience and asked if everyone already has the new record. The band continued with the title track, “Atoma”, after which they took a turn towards more classical material with “The Treason Wall.” As a whole, the setlist contained a delightful mix of newer and older songs – “Monochromatic Stains” and “The Wonders at Your Feet” to name a few. Atoma was featured with a total of six songs, including my personal favorite, “Clearing Skies.” Visually the show was entertaining, as DT’s background visuals must have swallowed a good deal of their tour budget, based on their quality. The light technician did a great job, ‘playing’ most of the lights himself, without pre-programming. The band seemed to enjoy themselves on stage: Stanne was his usual hyperactive self, bouncing around continuously, and the new bassist, Anders Iwers, smiled behind his formidable facial hair throughout the show. The guitarists, Christopher Amott and Johan Reinholdz, were both stand-ins for the tour, but it didn’t show from their playing – both are seasoned professionals after all. Because of the way the stage was set up, both Anders Jivarp and Martin Brändström were literally left behind, and especially Jivarp’s drum set was positioned to the far left corner – it would have been nice to watch his playing from a better angle. The main set was wrapped up with Projector’s classic, “ThereIn”, resulting in a loud sing-along in its chorus. The band briefly retreated backstage before the encores. “State of Trust” was a bit peculiar of a choice, since one could easily have selected a Dark Tranquillity classic instead, but “Through Smudged Lenses” was a killer – after all, Character is by far the band’s best record! The show was concluded with the band’s greatest hit, “Misery’s Crown”, still claiming a spot on the list of DT’s finest songs. The audience cheered long after the end of the beautiful outro, and Stanne didn’t have to ask for anyone to raise their hands for a group photo. An excellent show from an even more excellent band once again, I have to say!